Nothing stirs up Chaos like Vengeance. When Prince Kell returns to Ranello, he finds his homeland in ashes. The invaders from Thallus destroyed everything he held dear, leaving him heir to a throne he can’t claim. The thirst for vengeance consumes him and drives him right into the arms of the most unlikely of rebel leaders. 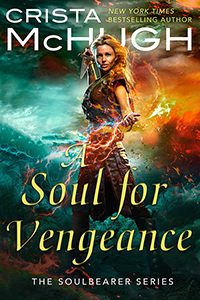 Zara has fought for months to keep the hopes of the Ranellian people alive. Finding Kell is just the thing their dying rebellion needs. But as she tries to soothe Kell’s bitterness and turn him into the leader he’s meant to be, she finds herself desiring the one man she believes she’ll never have. A man whose heart was broken by a yellow-haired witch named Arden Soulbearer. Available in ebook at B&N, Amazon, Google Play, Kobo and Apple! Available in print at Amazon, B&N, Book Depository, Powells, and IndieBound!